At least Karin Brownlee got an interview, but anyone with half a functioning brain cell knew she had no shot at the job as a Johnson County Community College Board of Trustees member. I'll try to keep this short, because there are a total of six people in all of Johnson County who give any cares at all to the happenings at JCCC. So the board selected Rayl's replacement. From a field of 13 applicants, they narrowed the pool to four, including Robert Drummond, Michael Lally, Steven Wolf and Karin Brownlee. I am not sure why they bothered with the dog and pony show that followed. The four contenders gave the board five minute speeches and then answered questions. And the board then selected Bob Drummond. Let's see a show of hands for those who knew Drummond was going to get the nod before the interviews even occurred. If your hand isn't in the air, you're doing it wrong. That was a foregone conclusion. Drummond served on the board of trustees previously and lost an election for another term. (There were about 700 candidates and the vote was at-large. There were six candidates. The top four made it. Drummond did not.) He is the CEO of TLC in Olathe. 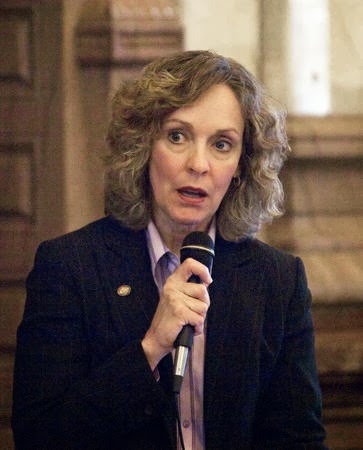 I honestly hoped to see Karin Brownlee, the former state senator and former Secretary of Labor given the job. But I knew better. Anyway, Brownlee walked a fine line between being a movement conservative and an Establishment hack. I think that line becomes more difficult to walk the longer anyone stays in office. In my mind, she was the perfect choice for the job at JCCC. Principled, conservative and with leadership skills to boot. Unfortunately, JCCC is the last bastion of the old Republican/Moderate guard in Johnson County. The mods have a death grip on that place, and they have no intention of giving it up. It's all very old money and old power collecting dust in a place where the board has limited power over the people but plenty of opportunity to appoint their friends to "professorships" and offer contract awards to their supporters. In short, someone like Brownlee had zero chances of being appointed. Her brief tenure at the Department of Labor shows she isn't willing to play that ball game. Good for her. Too bad for JCCC. She would've been great. Final note: I realize that the board of trustees most recent appointment -- David Lindstrom -- is a so-called conservative. He'll play ball (and I don't mean football) in awarding friends and supporters with titles and whatever. Nice guy, but he's got Establishment-in-training written all.over.his.face. Great post, but one correction. There were only 6 candidates for JCCC this last time, and the top four make it, and Drummond didn't.. Often there are a lot more candidates but this time there were not. Brownlee should have been the appointment, without question. Thanks, Anonymous, for the correction. I couldn't remember all of the specifics of the last race.